After playing Headlander, Double Fine’s new 70’s inspired science fiction platformer, for a few hours or so, I remember sitting back in my chair and saying to myself: “This is one weird game!” After that, I delved back into my play through, and as the hours rolled on that sentiment didn’t change. The only thing that I could compare Headlander to was a rather tawdry comic strip that I’d seen while skimming through an old Heavy Metal magazine back in the day. 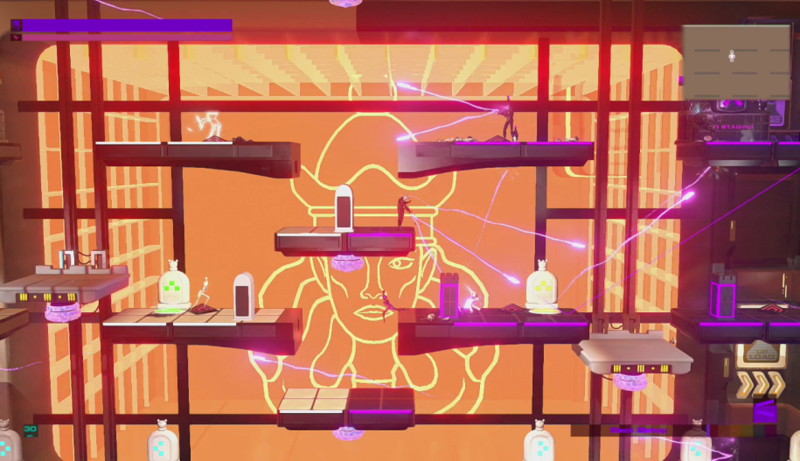 In Headlander, you step—or rather levitate onto—a robotic-bodied protagonist. Well, you’re not quite all and nuts and bolts. You see, humanity has long been extinct and you are the last actual flesh and bone remnant of the human race, at least your head is. Your disembodied head is encased in a special helmet with thrusters mounted on it which has the ability to detach itself, zip around, and then vacuum the heads off of other androids that you encounter. In this retro-futuristic utopian (or dystopian, depending on how you look at it) setting, humans have transmitted their consciousness’s, or souls if you will, over to robotic bodies. An evil AI has taken over all of this brave new world, filled with various robotic civilians as well as the guards that oversee them and enforce order and compliance. I must say—Double Fine definitely nailed the whole early to mid-70’s aesthetic, and the counter-cultural vibe and conventions are very appropriate to the game’s premise, which is about standing up against authority and the big bad guv’ment. 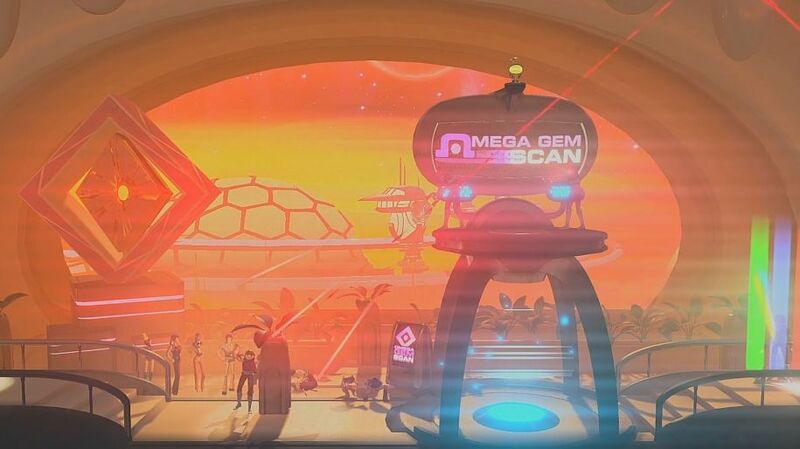 Gameplay-wise, Headlander strongly reminded me of the Metroid series, although probably a more modern comparison could be made to Ori and the Blind Forest, although the latter is a much more sophisticated game. Clever use of such things as film grain, as well as bright, groovy, neon colors that saturate the backdrops is here, and sometimes reminded me of scenes ripped from 1976’s science fiction drama, Logan’s Run. Decidedly both weirder and more whimsical than the more heavy science fiction films from that era, such as Soylent Green, Headlander’s overarching plot is pretty simple: Cruise around in various environments looking for heads to crank off so that you can get to the harder to reach areas, and therefore closer to the main baddie. 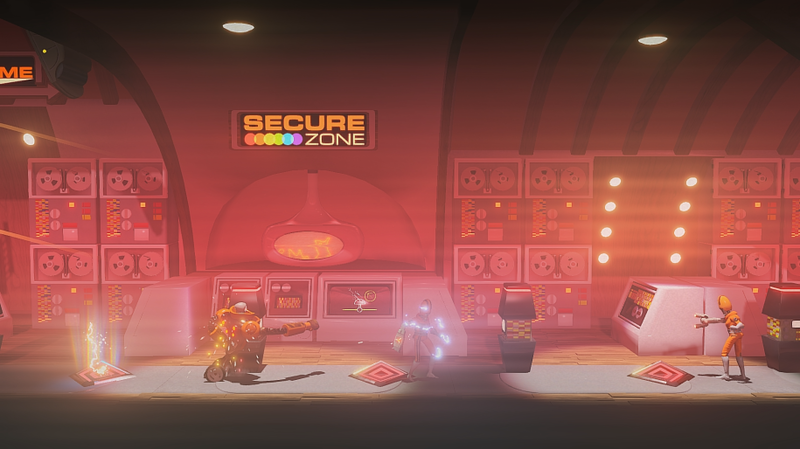 As stated, In Headlander, taking control of the different characters and guards that you come across can allow you to traverse into restricted areas. Some are pretty easy to figure out—that guard over there wearing the green outfit probably allows you to gain access to that similarly green door that you haven’t been able to get through. Others are a bit more challenging to comprehend. Keep in mind that while your headless wonder is doing all of this exploring, you’ll invariably come across hostiles in the form of not only guards, but the game’s various bosses. Headlander’s combat was revealed to me in layers. At first, combat seemed fairly simple and straight forward. But as you progress throughout the game and run up against increasingly harder opponents, it opens up to be more and more complex. One of the nuances that I soon discovered was the ability to bounce laser shots off of different surfaces and (hopefully) hit my enemies square in their craniums. In that way I not only got an insta-kill, but also saved a lot of ammunition, while giving me the opportunity to easily vacuum my head right onto their bodies. Progress in Headlander is punctuated by a wide array of upgrades and weapon kits, but I only found myself focusing on certain ones while ignoring others which I felt were useless. As you gain experience, you also acquire new types of attacks, and for the most part they are a blast to utilize. You can also upgrade your defenses, such as personal shielding. So, it’s not all about offense. 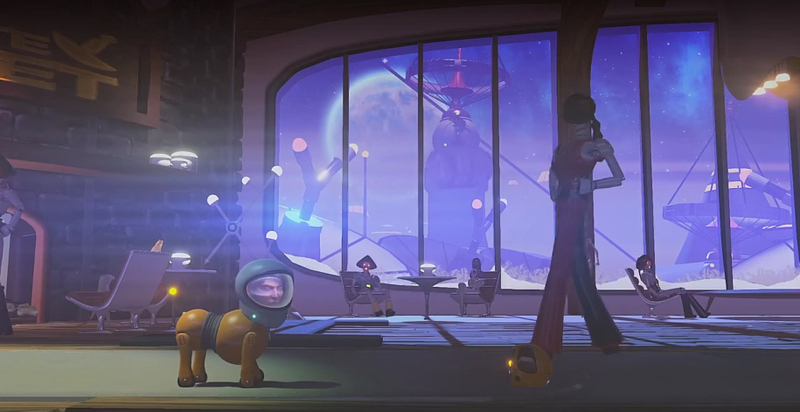 Don’t expect to be mystified by the puzzle aspects of Headlander. Quite simply put, they are pretty easy to figure out. Combine that with some rather wonky controls, and it can feel like a bit of a trudge at times, and becomes a little repetitive in certain parts. 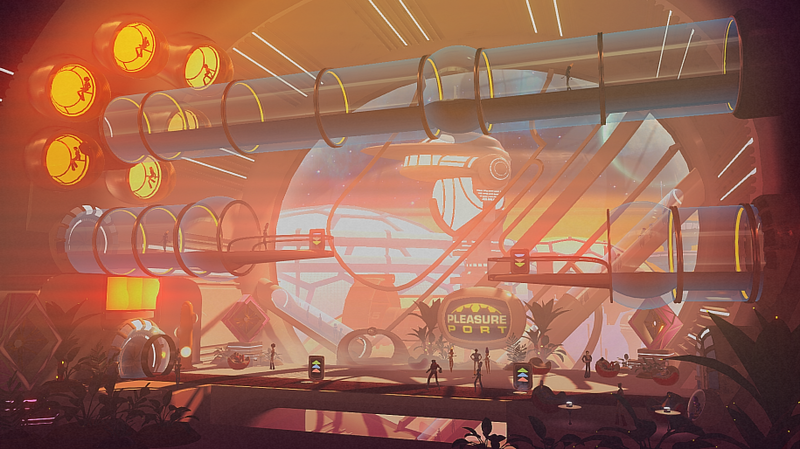 However, Headlander is so jam-packed with atmosphere and so dedicated to its 70’s stylings, that those minor annoyances were easy to overlook. 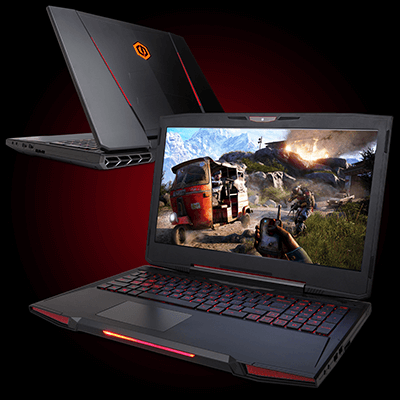 Headlander’s graphics are very detailed and its garish colors really stand out well on higher resolution gaming PCs and gaming laptops. The sound department is likewise very immersive, with piercing screams and yells, crisp laser fire, and funky, groove-tastic tunes. 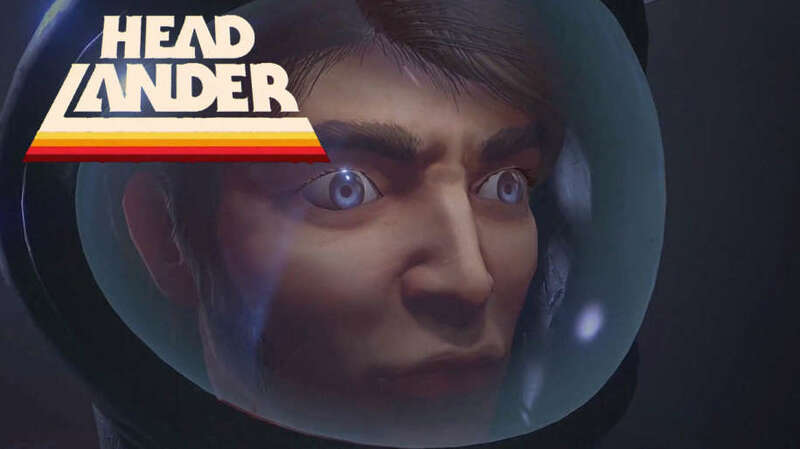 I really like what Double Fine has done with Headlander. It’s a nice reprieve from all of the hyper-violent and humorless fare that is on offer these days. Although the game does feature some more serious content, such as questions dealing with what it is to truly be human, spirituality, and the like, it’s done in such a witty and charming manner that doesn’t feel too heavy-handed. Anyone who would enjoy a humorous and wacky science fiction adventure romp set against 70’s-inspired backdrops, should give this little gem a try. Headlander doesn’t try too hard to wow you, and its whimsical nature and tongue-in-cheek vibe will charm many a gamer, at least it did me. I’d like to see more developers out there take risks like this—they could just end up creating a fun and original gaming experience just as they have here with Headlander.